While acknowledging the good work of the organization, some of its more recent trends are a bit concerning. The purpose of this posting is to highlight these recent trends towards Roman Catholicism and mysticism. Answer: Youth with a Mission (YWAM) defines itself as “an international volunteer movement of Christians from many backgrounds, cultures and Christian traditions, dedicated to serving Jesus throughout the world.” The stated purpose of YWAM is “to know God and to make Him known.” Ministry teams focus on evangelism through teaching, house construction, medicine, sports, performing arts, and other methods. Youth with a Mission offers training through the University of the Nations, which they operate in 650 locations in 160 countries and about 100 languages. Part of the University of the Nations training is an intensive, five- or six-month Discipleship Training School meant to prepare individuals for cross-cultural ministry. In addition to its statement of faith, YWAM affirms the Manila Covenant, the Lausanne Covenant, and the Christian Magna Carta as being consistent with its beliefs. Various devotional practices supported by Youth with a Mission include Lectio Divina, speaking in tongues, and contemplative prayer. Also problematic is their recommended reading list, which promotes works by mystics and Catholics such as Henri Nouwen, Thomas Merton, Mother Teresa, and St. John of the Cross. Focused on world evangelism, YWAM frequently partners with other ministries and churches for the purpose of spreading the gospel message to new people. Past partnerships have included alliances with groups such as Christian Aid, Cru (formerly Campus Crusade for Christ), the International Mission Board, Wycliffe Bible Translators, and World Vision. Youth with a Mission has openly embraced the Catholic Church. In fact, YWAM has a self-governing, international branch called Kerygma that works primarily in the Roman Catholic world. Members of these “KTeams” are of various church traditions, but they operate with what they call a “Catholic Ethos” (http://www.ywamkb.net/kb/Kerygma_Teams, “Kerygma Teams,” accessed 9/28/2016). The goal in Kerygma is to allow “Catholics to participate in YWAM’s calling, and at the same time have these Catholics remain rooted in their church and be free to express their Catholic faith” (http://www.kteams.org/, “Our History,” accessed 9/28/2016). In other words, although Youth with a Mission is predominately Protestant, they no longer evangelize Catholics but work with them to build the Catholic Church in some areas. In its more than 50 years of existence, YWAM has done much good work, operating in many areas around the world and helping countless individuals find Christ and grow in their walk with God. Its commitment to ecumenism, however, is troubling. More information about YWAM and its efforts can be found at ywam.org. => So, today, instead of evangelizing Catholics, they are building up the Catholic church in various areas. What does that mean for those who came to Christ as a result of YWAM’s evangelism in the past? Accepting a works-based justification for salvation instead of grace-based? Why the turn towards contemplative mysticism? How does YWAM justify that direction from the Bible? These are troubling questions that need to be asked of YWAM and should be a red flag for Evangelicals in their acceptance of YWAM. Again, these are only questions and they are asked while acknowledging their past accomplishments for the faith. Ruth has been a student, a practitioner, a teacher and a leader in the area of Christian spirituality and SPIRITUAL FORMATION for twenty years. A trained SPIRITUAL DIRECTOR and RETREAT leader, she is the author of numerous booksand resources on the spiritual life. Ruth travels widely, teaching and consulting with leadership teams in the areas of leadership transformation, corporate discernment, and spiritual community. She has served on the pastoral staff of several churches, including WILLOW CREEK Community Church. Ruth has taught at the Wheaton College Graduate School, Denver Seminary, Northeastern Seminary and Mars Hill Graduate School and is a senior teaching fellow for the Renovare Institute [RICHARD FOSTER]. She has recently joined the faculty of Northern Seminary as an adjunct Professor of Spiritual Transformation. Looking at the part of her training from the SHALEM INSTITUTE, much could be written on this part alone. We have done some of this in previous postings. Very little Scripture is used – actually, I think no Scripture is used. They begin the session – not with a prayer but a moment of SILENCE. They talk about prayer with the source of prayer emanating from DEEP WITHIN ourselves (classical mysticism). They lift up those who are participating in the CLIMATE MARCH – referring to the Earth as their “SISTER MOTHER EARTH”. The speaker, MirabaiStarr talks about her guru – named – “Bubba” something or other, who died in 1970 but travels with her today and continues to hold her? She asks the audience to sit straight, to control their breathing – “to feel the breath through a whole cycle to wash every cell in their body”? Refers to their YOGA BREATH. Later in the talk, she encourages the audience to stop thinking, “dismiss the eternal” which she quickly corrects herself to “dismiss the internal editor” causing you to think about what you write (i.e. don’t think). She explains the “feminine presence of the Divine”. She calls upon the group to engage in CONTEMPLATIVE PRAYER. She tests the validity of their experience by seeing if they end up with “more love towards others” (not if it is given by God through His word, the Bible). There is another video listed next to this video and it shows MirabaiStarr giving another talk entitled – “BUDDHA AT THE GAS PUMP“…….etc. That sounds enticing I’m sure. This list is just a sampling from the video – I could go on and on. But the above topics all fall under the subject of MYSTICISM, CONTEMPLATIVE PRAYER, SPIRITUAL FORMATION……etc. Unfortunately, these characteristics are today, commonly being copied, borrowed, combined…etc. with historic Christian practices – both within traditional mainline denominations as well as Evangelical denominations. Much of the origin of these practices originate from ancient Roman Catholic mysticism as well as from Eastern religions (i.e. Eastern Mysticism) such as Buddhism, Hinduism…etc. That is why I think these practices can be dangerous to the church and likewise, Scripture has a great deal to say about warning believers to NOT mix in and accept pagan practices. But again, unfortunately, that is what is being done in the church today and in particular, it is becoming common in seminaries across the country from various denominations. In previous postings, we have looked at the influence within the ASSEMBLIES OF GOD, NAZARENE, CHRISTIAN & MISSIONARY ALLIANCE, BAPTISTS, EVANGELICAL FREE…etc. churches. Seminaries included AMBROSE, NYACK….etc. Let me give some specific examples – don’t feel bad if your denomination is not on this list because in reality, many if not most Evangelical denominations are developing a track record in CONTEMPLATIVE PRAYER, MYSTICISM, SPIRITUAL FORMATION...etc. Two and a half years ago the leadership of the Western PA District of the Christian and Missionary Allianceinvited Ruth Haley Barton to speak to its pastors and lay delegates at its annual District Conference. I sat in amazement as I watched my fellow pastors nod their heads in affirmation as Mrs. Barton said Moses went in to the desert to meditate. I didn’t see my fellow pastors turn to the book of Exodus to read the account of Moses. My Bible says Moses went to the desert to escape being killed by Pharaoh. Mrs. Barton also twisted the account of Elijah to say it was contemplative meditation which brought him out of his despair and depression. At no time did I hear anyone in District C&MA leadership correct Mrs. Barton’s misrepresentation of Scripture. Other Districts also have had Mrs. Barton speak to their pastors. The late Brennan Manning and other heretical teachers also have been promoted. When I questioned my District Superintendent about the use and promotion of Mr. Manning, I was told he must be all right, because the denomination has used him as a speaker at national youth rallies. When I learned last spring that my District had invited as speakers for our next District Conference two C&MA seminary professors who teach contemplative meditation, I decided it was time to resign from the C&MA after __ years of ministry. Sadly, the C&MA is no longer what it once was. Currently my wife and I are working secular jobs, and I preach in independent churches when given the opportunity. Prospects for full-time pastoral ministry seem slim, since I am __ years old. However, I would rather do what I am doing than continue to support the heresy being promoted in the C&MA. Everywhere in God’s Word where meditation is mentioned, the object of meditation is God’s Word, God’s law, God’s statutes, etc. I see no mention of a centering prayer that I heard Mrs. Barton promote. I want no part of pagan, vain repetitions. Using Christian words doesn’t negate the pagan practice. I was saved out of Catholicism and want no part of Catholicism, Hinduism, or Buddhism. The C&MA has never corrected their error in allowing for these mystical practices that originated from outside the church, outside of Scripture and have more in common with other religions. The reason is that they don’t view these issues as an error. Today, the Alliance Theological Seminary continues to train future leaders and pastors in these same practices. In my opinion, the C&MA should renounce their participation in these practices to warn and correct current leaders from straying away from God’s word. But, they have not chosen not to take that approach. So, mysticism is alive and well in the Evangelical church today – and as Paul warns Timothy and Jude warns believers – error creeps into the church from within the leadership and over time has a detrimental effect on the church. What will other denominations do? The NAZARENES, BAPTISTS, ASSEMBLIES OF GOD, EVANGELICAL FREE……..your church? At the risk of giving her free advertising, some things in Christianity just leave me shaking my head. RUTH HALEY BARTON and her promotion of SILENCE and SOLITUDE. Don’t misunderstand – It is not wrong to relax with some alone time, silence….etc., but if the goal is to not think and instead it is recommended that you push out from your mind thoughts about anything and everything (some will even push out thoughts about God), in order to get into a state where one supposedly is open to hearing directly from God (or whoever starts communicating with you in this state….etc.) – One should ask – IS THIS SCRIPTURAL? The short answer is that the Bible does NOT promote this as a normative prayer meditative practice. The few verses that some try to use to justify this are usually taken out of context. Instead, what is recommended is an experience-driven practice with the addition of practices to help you get into this state – such as the repetition of words (i.e. mantras) to clear out your mind. => “Come away and rest awhile.” Jesus invites us to be with him, offering our full and undivided attention to him. When we choose retreat we make a generous investment in our friendship with Christ. Truth is, we are not always generous with ourselves where God is concerned. Many of us have done well to incorporate regular times of SOLITUDE and SILENCE into the RHYTHM of our ordinary lives which means we’ve gotten pretty good at giving God twenty minutes here and a half an hour there. And there’s no question we are better for it! BUT WE NEED MORE. Indeed, we long for MORE. In these pages Transforming Center founder and seasoned spiritual director, Ruth Haley Barton, gently and eloquently leads us into an exploration of RETREAT as a key practice that opens us to God. 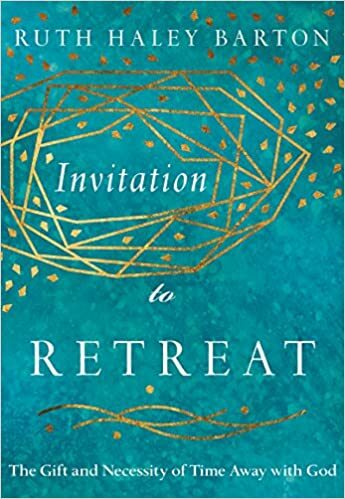 Based on her own practice and her experience leading hundreds of retreats for others, she will guide you in a very personal exploration of seven specific invitations contained within the general invitation to retreat. You will discover how to say yes to God’s winsome invitation to greater freedom and surrender. There has never been a time when the invitation to retreat is so radical and so relevant, so needed and so welcome. It is not a luxury, but a necessity of the spiritual life. Her recommendation of increasing the time spent in SILENCE and SOLITUDE by participating in RETREATS is a common practice among those promoting these types of spiritual disciplines. I’m sure most of us have been on retreats before – hopefully learning something to improve your walk. However, these types of mystical practices have a history in Roman Catholicism. One stream goes back to the Jesuits. The retreat was popularised in Roman Catholicism by the Society of Jesus (Jesuits), whose founder, St. Ignatius of Loyola, as a layman began, in the 1520s, directing others in making (participating in) the exercises. Another form the Exercises came in, which became known as the nineteenth “Observation”, ‘allowed continuing one’s ordinary occupations with the proviso of setting aside a few hours a day for this special purpose.’ The spiritual exercises were intended for people wanting to live closer to God’s will for their life. For now, we will just introduce (warn) you to this upcoming book by Ruth Haley Barton as we review current trends within Christianity. We will follow up in future posts on specific issues relating to this topic.